Thank you to all who attended the workshop complementing our multi-client study into the IMO 2020 transition. 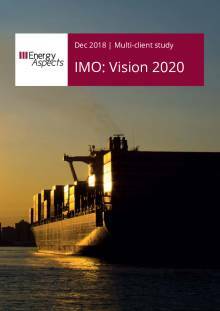 We hope you found it valuable and enjoyed the opportunity to engage with so many of you.A recording of the presentations, slides and Q&A from our IMO: Vision 2020 Workshop in London o.. The global shift in the sulphur content of marine fuels mandated by the International Maritime Organization (IMO) will have wide-ranging effects for the entire oil industry, affecting not just fuel oil, but distillates, gasoline and crude.From 1 January 2020, ocean-going ships will have to use ma..